Growing up in Ontario I learned not just to enjoy winter but to love it. The crisp air, the silence of a snowfall and the crunch of ice and snow under your feet all add to the magic. Throw in some snow-shoes, a toboggan run and some hot chocolate and you have memories that last a lifetime. 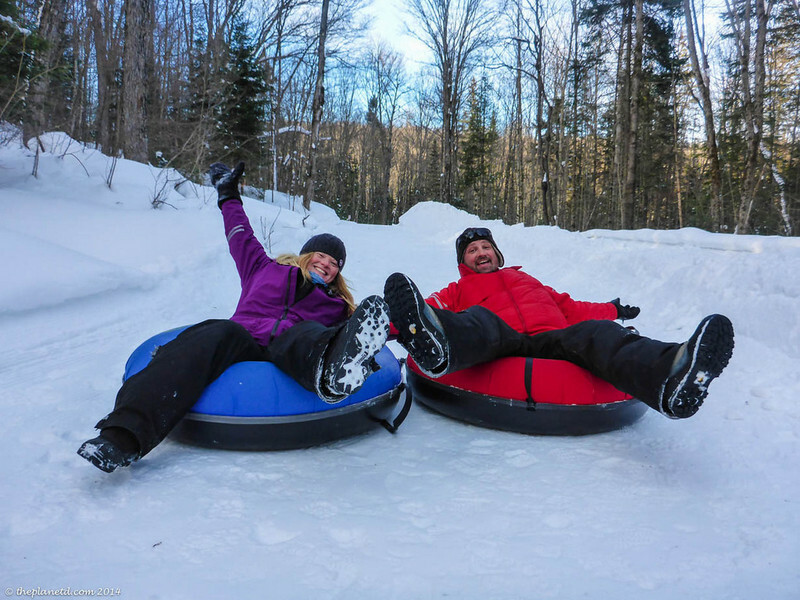 With so many great activities happening this winter at Ontario Parks there’s no reason to stay inside and here’s a list of activities to get you started. Camping in winter can be a tough sell to the un-initiated but the Friends of Frontenac Provincial Park want to help. Located just north of Kingston the concept behind this park is described as a “Threshold to Wilderness.” Think of it as a gateway to the great outdoors. This January the Friends of Frontenac are offering two classes to help you warm up to the idea of winter activities. On January 17th, the Friends of Frontenac Park are presenting a introductory session on enjoying winter camping in our parks. It’s called Winter Camping Trip Planning and it covers the basics involved in planning a successful, low impact winter camping trip. Topics covered include route selection, safe forms of winter travel, clothing and equipment. Participants are welcome to ask questions and share their knowledge. Class is limited to thirty five persons so call to register. On January 25th, the Friends of Frontenac Park are offering a snowshoe class called Snowshoe Workshop and Walk. It’s presented by Ed Grenda and covers different types of snowshoes and techniques used. This is an active outdoor class, pack a lunch and be prepared for a winter day. Some snowshoes are available for loan so call ahead if you need to borrow or rent a pair at the park. The cost for both courses is a Daily Vehicle permit and you can register by calling the park at (613) 376-3489. Check the park’s list of training programs for more information. Every winter my school would organize snowshoe field trips for our classes. The snowshoes were heavy wooden jobs, you never got the right size and the trails we walked on were so heavily used the snow was packed as hard as asphalt. We loved it. Times have changed and these days the type of snowshoes offered are light, compact and easy to use. It’s a great activity for families or individuals and you can scale the level of workout to suit everyone. A quiet backwood exploration or a trail running workout, it’s your choice. Discover fresh moose tracks, birdwatch or take some winter photos. 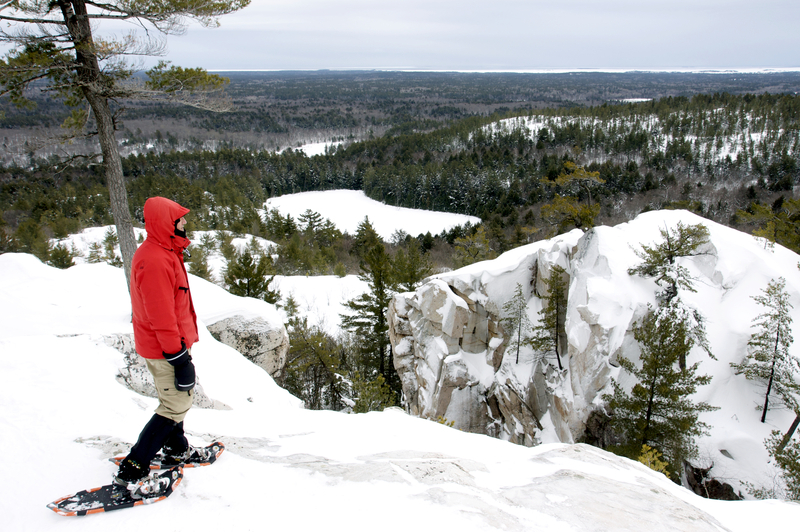 Snowshoeing offers something for everyone and is a great way to enjoy Ontario Parks in winter. 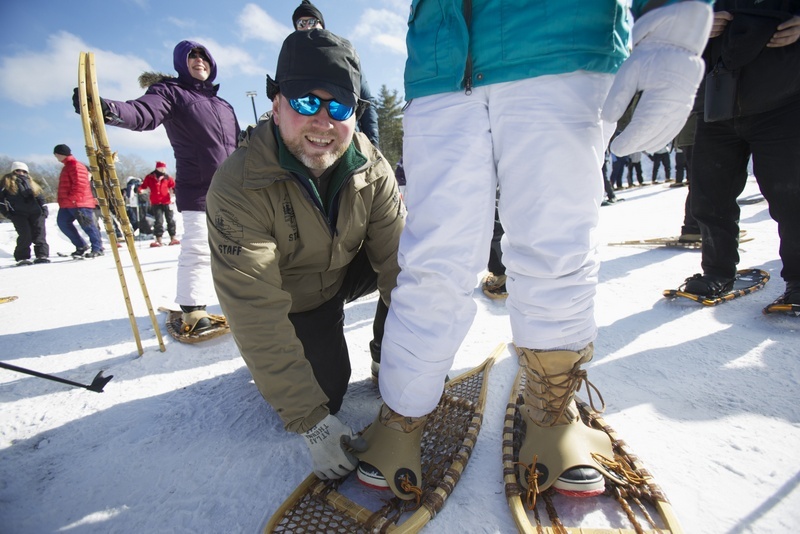 You can rent snowshoes at several parks including Pinery, Arrowhead, Killarney and Wasaga Beach. If you want to try somewhere a little off the beaten track, try visiting Mashkinonje Provincial Park. With over thirty-five kilometers of looping trails there’s something for everyone at every skill level. Located on the western arm of Lake Nipissing it’s about a four hour drive north from Toronto. Located just north of Huntsville, Arrowhead Provincial Park is the only park that can boast owning it’s own zamboni and they use it to groom the one and a half kilometer trail through the woods to ice-rink perfection. There are two fire pits along the trail for skaters to warm up by and the park offers skate rentals for $6.00 or skate sharpening for $5.00. It’s a popular event that has people coming back year after year. As a kid, tubing and tobogganing was about as good as it got. For three or four months of the year no hill was safe from our need for speed and attempts to get air. Ontario Parks offers some of the best tubing around with venues at The Pinery, Arrowhead and Bronte Creek. Arrowhead even rents the tubes and and is working on perfecting their downhill winter run. Bring a thermos of hot chocolate and you’ve got a great day guaranteed. Mid February offers special Family Day events at some provincial parks with one of the biggest being hosted at Algonquin park. 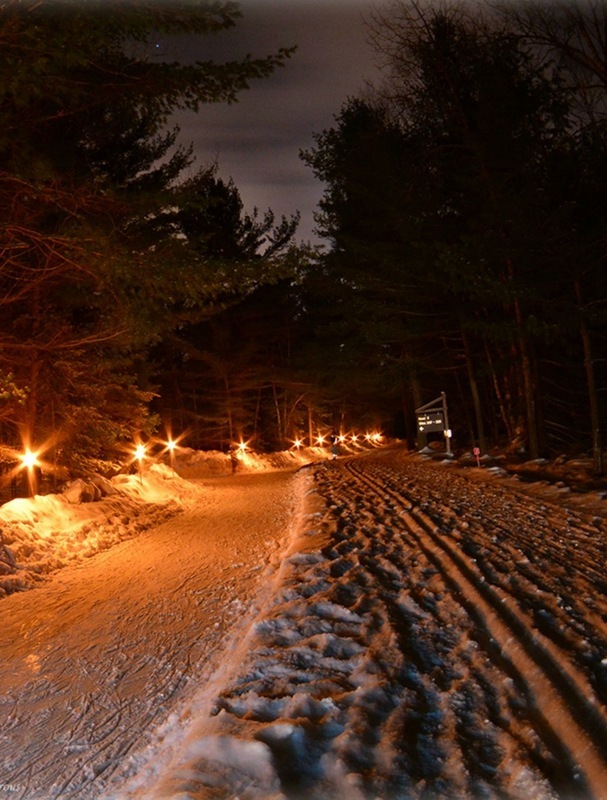 On 14th February 2015 (Family Day Weekend), Algonquin Provincial Park is having it’s Winter in the Wild Day with guided snowshoe tours, a bonfire, a barbecue and an invitation to join up for a hike to enjoy the winter wolf howl. Admission is free but you will need a park daily vehicle permit, check the park’s webpage for more details. Killarney Provincial Park also hosts two days of family day activities including stargazing, guided hikes and art workshops. If Pinery Provincial Park is closer they’re hosting Family Day activities from February 14th to 16th with tobogganing and skating for everyone.